I’m always looking for new side dish recipes and this one was great for our Surf & Turf night. I’ve become a fan of Spaghetti Squash. I think the times I tried it in the past, I struggled to get the squash cut in half. Using the microwave to soften the squash makes the biggest difference. 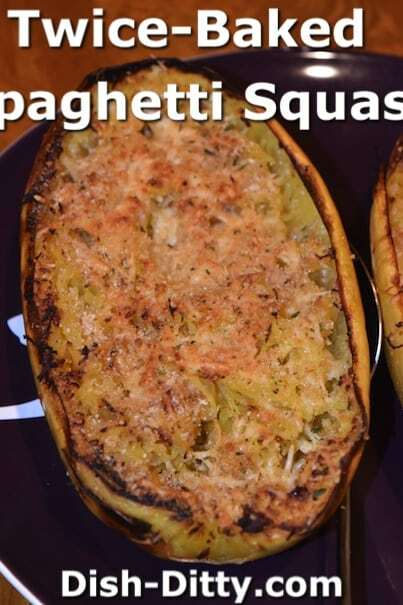 Then roasting the spaghetti squash intensifies the flavors. Preheat oven to 375 degrees, using Roast option, if available. Score the squash and cook in microwave for 3-5 minutes to soften enough to make it easier to slice squash in half. Let it cool slightly and slice in half. Remove the guts and seeds. Rub Garlic Olive Oil all over the squash and season with salt & pepper. Place on a cookie sheet face down and roast for 40-45 minutes, or until squash is fully cooked. Spaghetti the squash using a fork... so just fork it. Add about 1 Tbl of garlic olive oil to each half, a couple dashes of salt and a couple tablespoons of parmesan cheese. Toss. Top with more parmesan cheese and breadcrumbs. Bake at 375 degrees for 10-15 minutes, or until the top is light brown. Serve in the skin. When the squash is done, remove from the oven and flip over. Using a fork, scrape the inside of the squash that will come off like spaghetti noodles (hence Spaghetti Squash). Do this until most of the flesh is revealed as spaghetti. Do not puncture the outer layer. 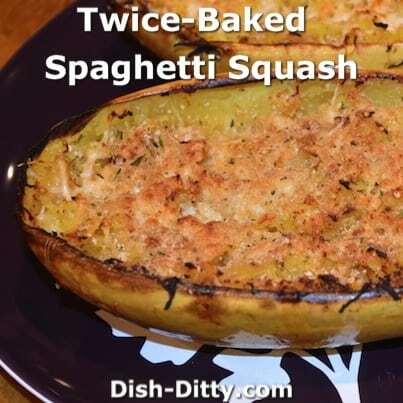 No Replies to "Twice Baked Spaghetti Squash Recipe"